Lives in the public and private spheres are enhanced when communication is clear, practical, appropriate, and generative. 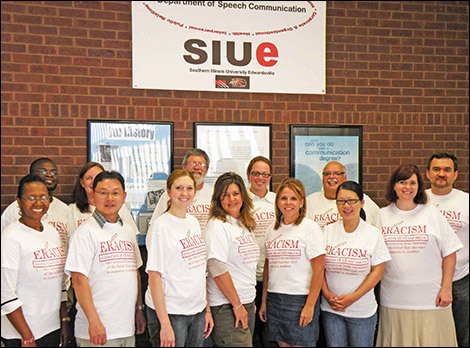 The mission of the Department of Applied Communication Studies at Southern Illinois University Edwardsville is to educate students towards becoming capable, ethical, and resourceful communicators. Valuing academic rigor, connection to professional practice, as well as community involvement, the Department embodies the teacher-scholar model which focuses on enhancing communication competence and adaptability, both of which are critical components of a diverse and inclusive society. We are dedicated to cultivating reflective, informed, and competent communicators capable of improving individual, organizational, and community life. We are committed to developing and maintaining a teaching curriculum that is theoretical, heuristic, integrative, and practical. We contribute and value research and scholarship that advances the knowledge of the applied communication studies and helps explain various aspects of communication. We are devoted to providing our students with specialized instruction that builds upon general education and also prepares them for their future professions. Our students are offered numerous opportunities for putting to work what they have learned in the classroom for the benefit of others, of organizations, and of communities. We are inspired to further develop and maintain our department's culture, which is an atmosphere that is accepting, diverse, collegial, and service-oriented. We are committed to reaching across disciplines and establishing relationships with colleagues from other departments. These collaborations foster a rich learning environment for our students and provide them with a comprehensive, multidisciplinary education. We are motivated to model excellence, professionalism, and integrity in our teaching, scholarship, and service.